Start by melting the butter over medium low heat in a 10-12 inch sauce pan. Add the leeks and onions and sweat just until translucent. Avoid any caramelization from forming in the pan as it will change the flavor and color of the final product. The white wine is added next and cooked until it has nearly all evaporated from the pan. Add the corn kernels, thyme and bay leaf to the pan and cook for another 8 minutes over medium low heat stirring every couple minutes to avoid any color and help even distribution of cooking. Once the corn has cooked, add the milk and heavy cream. Bring to a low simmer and cook for another 10 minutes. Remove from the stove and discard the thyme sprigs and bay leaves. Strain the liquid from the corn and use that to puree a third of the corn onion leek mixture in a blender until velvety smooth. Reincorporate the pureed corn into the whole corn and adjust seasoning with salt and pepper. 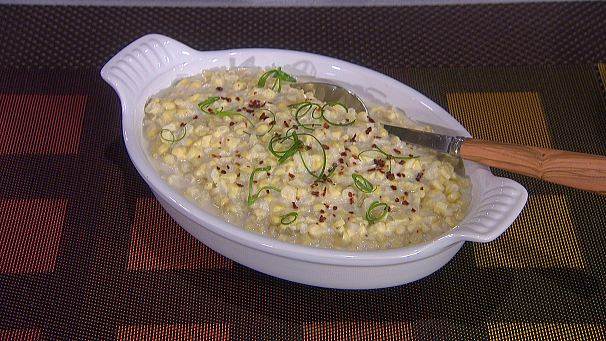 Garnish the creamed corn with a sprinkle of Aleppo pepper and thinly sliced green onion tops.